Comment: We know aquamarine is supposed to be primarily blue (the green melts under heat) but this rarity is primarily green (to my eye) with a full dose of blue, yes, but overall on the green side. Note that IGI has nevertheless graded it as greenish blue. I assume out of principle. 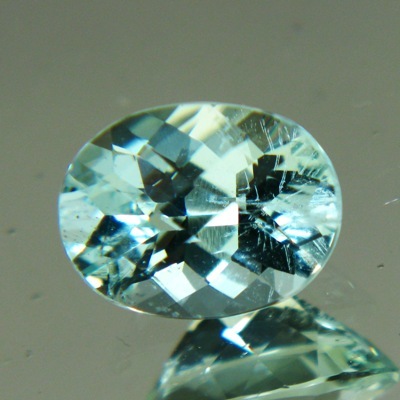 Aside the fact that the green is proof of no-heat, I think the gem also deserves a new name, a mix of green beryl and aquamarine: how about 'aquaberyl'? 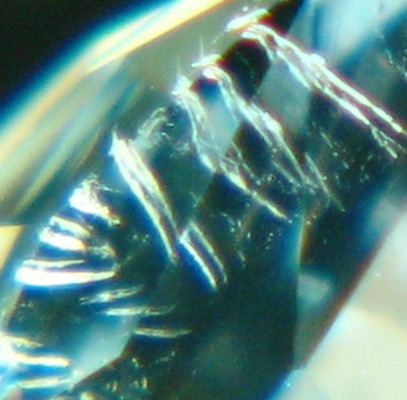 See the interesting inclusions that sit just on the lower edge of the gem: From the front (with lens only) they look like a spiders-net, but from the side they are revealed to look like tooth-roots. Do not be scared: All these are not visible to the eye but make a fascinating study under the lens. 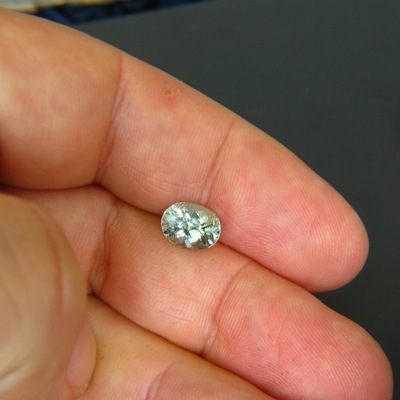 Green aquamarine in ring size, way off the beaten path, pretty and sparkly, charming and precise checkerboard cut. No window, no treatments, and a story to tell. Big IGI report. Free shipment and rainforest protection, all under $1k.